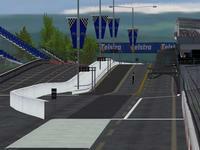 This is WIP5 of the Sydney track. We'd like to thank Ryan Callan for his adjustments to some graphics settings. This version gets some new adjustments to ripple strips and a wet version for a public release. We have updated the links so make sure you get the UPDATED FULL - if not get the patch. If you don't you may end up falling through the road. There are currently no setups for FVR Sydney Telstra 500. Add a Setup. Even though it's a horrible circuit, you made a great mod!!! Got it to work thanks guys love ya work. Hi guys would love to give it a go but cant down load error keeps poping up in link (bugga). You guys do sush a good job with thing so thanks in advance cant wait to give it a go .